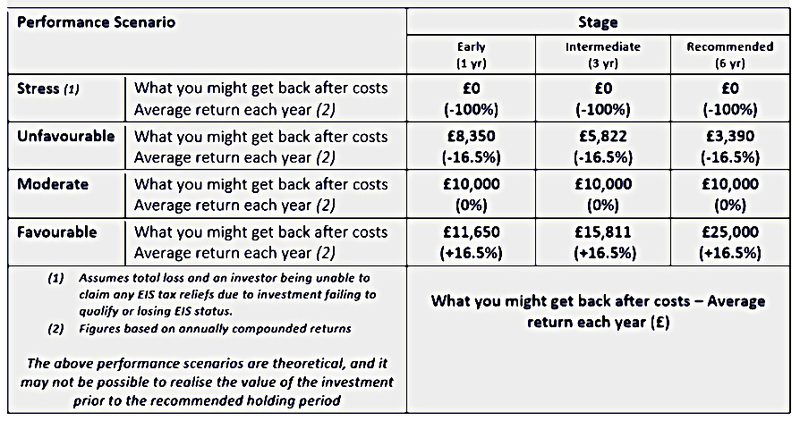 Today’s post is a look at a couple of EIS Growth funds – later stage EIS opportunities. We first looked at EIS funds back in December 2016. I was worried that I might not find enough VCTs to offset my tax liability for the 2016-17 tax year. In the event, although it was a scramble, I was able to find enough VCTs. But I invested in Syndicate Room’s Fund Twenty8 in any case. The EIS funds we looked at last time – Startup Funding Club was the other one I liked – were early stage EIS funds. Both firms come out of an Angel Investing background. The idea with the funds we’re looking at today is that the underlying companies are later stage firms coming back for a second round of money. I should also point out at this stage that I’m not entirely neutral about the two firms whose funds I’m looking at today. As part of the normal process of investing / intending to invest in their regular SEIS / EIS funds, I’ve been to a number of not unpleasant pitching evenings with free drink and food. So I am well-disposed to them, as I assume all their investors are. These funds are not for me – not this tax year at least. Following the mad rush for VCTs in 2016-17, I applied early this year and have a full set for 2017-18. My partner has unexpectedly gone back to work in the past couple of weeks, so for various complicated reasons she doesn’t need any VCTs or EIS this year, either. People like me who have maxed out their pensions (on the LTA) and have no alternatives to offset income tax. Those earning above £85K, and especially above £100K, who are likely to have used their annual SIPP and ISA contribution limits. Those who like to invest in startups, but prefer to reduce their risk by investing in 5-15 companies, rather than just one. 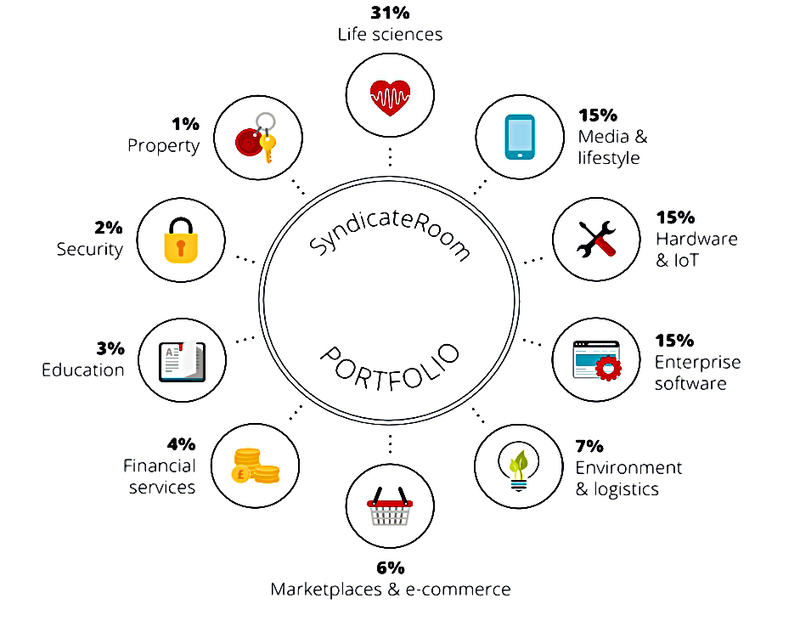 The Syndicate Room (SR) Growth Fund (“The Fund”) will invest in at least six companies that have been funded from the SR platform since 2013. That gives a universe of at least 110 companies to choose from, and this is expected to have risen to 150 by the time the fund closes. Using historical investment data and subsequent equity events, the SR Portfolio theoretical value as of the start of 2017 was 114% of subscriptions (163% after EIS tax relief). The idea behind the Fund is that the existing relationship and proprietary knowledge of these firms means that SR are well placed to choose the best 6+ prospects. This means that the companies that the Fund invests in should be performing well since their previous funding round. But SR also reserve the right to invest in a non-SR firm if the right opportunity appears. The diagram shows a hypothetical fund composition based on historical data. The Fund will invest alongside Lead Investors who will set the investment terms (price etc). Each investment will be for between £250K and £2M. The target IRR for the Fund is 20% (including the EIS tax relief). If you exclude the tax relief, the IRR drops to 10.6%. Note that Fund investors have no voting rights and no pre-emption rights. Fund Twenty8 has pre-emption rights, which protect early investors from later dilution. The firms are unlikely to be profitable at the point of investment. The minimum investment is £10K (as per Fund Twenty8) and the closing date is 30th March 2018. The fund is planning to raise a total of £9M. It will take 18 to 24 months to invest the money it raises. The target holding period is three to seven years (three years is the minimum for EIS relief). Fees are 1% initial (plus £10 for your EIS 3 form), 1.5% annual, and a 20% performance fee above the first 100% returned. The annual fee is higher than for Fund Twenty8 (which was 1% pa) and the first seven years fees (10.5%) are being retained from the subscription monies. From memory, the Fund Twenty8 performance fee hurdle was higher, too – at 120%. Note also that you are sent one EIS form per investee company. The Startup Funding Club (SFC) EIS Growth Fund will be managed by Enterprise Investment Partners (EIP). The two firms have offices close to each other in King’s Cross / St Pancras. The fund has a target maximum size of £10M and closes on 4th April 2018. That’s a few days after the SR fund, but still in this tax year. SFC and EIP will invest “up to £50K” into the fund between them. EIP also managed SFC’s earlier Epicure Fund (and another fund that I haven’t been able to identify). The Epicure Fund invested a minimum of 10 startups in the food and drink industry. It had a minimum investment of £10K and no ongoing fees (performance fee only). SFC have a portfolio of more than 100 companies that they have helped over the past five years. Like the SR Fund, the SFC Fund may also invest in companies that SFC haven’t helped before. In 2016, SFC was awarded ‘Lead Syndicate of the Year’ by the UK British Angels Association (UKBAA). More recently, SFC was awarded the ‘Best Angel Syndicate’ award at the 2017 Growth Investor Awards. I managed to find a Key Information Document (KID) for the SFC fund. On the basis that “a picture paints a thousand words”, I’ll present a few highlights from that. For those who have never knowingly look at a KID (that includes me), it could prove educational. Note that I expect that the SR Fund’s KID would look very similar. This is the product definition, and the intended market. Note that SFC have a 3 to 6 year holding period, one year less than SR.
I’m not sure how they plan to achieve an earlier exit. 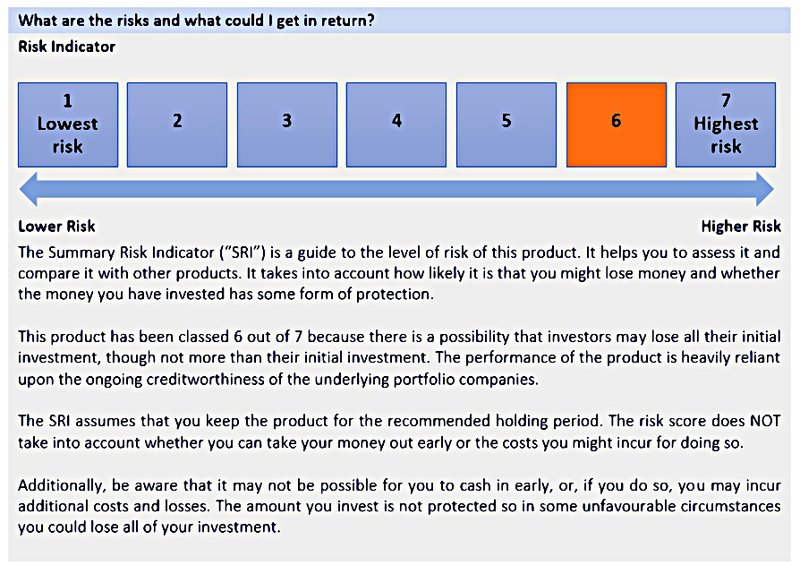 Here’s the risk rating, which is 6 out of 7. I don’t think that you can argue with that. It seems only things where you can lose more than you put in are rated 7. 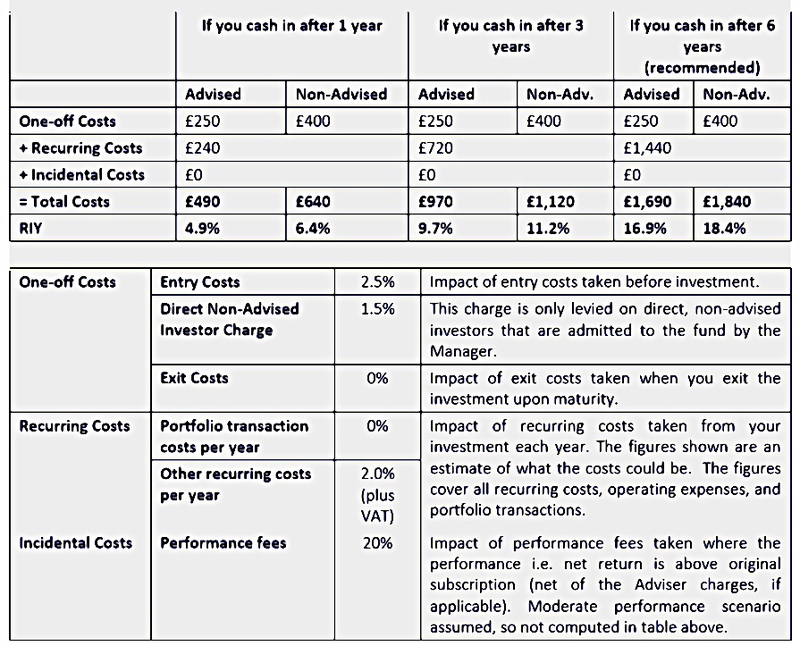 Here are the costs, based on a £10K investment. Note that the actual minimum investment in the fund is £25K, not £10K. For me, that’s too high. In a typical year, I only need to (and am only allowed to) offset basic rate income tax. For 2017-18, that’s £33.5K at 20%, or £6,700. With a 30% relief rate on VCT / EIS, I can only invest £22K per year. So a £25K minimum rules me out straight away. And there’s an annual management charge of 2% (under “other recurring costs per year”). This is new for SFC – their Angel funds and the Epicure fund have no annual charge. There’s also a performance fee (not shown in the table) of 20% after the initial subscription has been returned. That’s after 100% compared to 110% for the SR fund (and 120% for Fund Twenty8). The scary number is the total cost to a non-advised investor over the recommended 6 year holding period. It’s 18.4% – more than 3% per year. So you need pretty good returns to overcome this hurdle. The last chart from the KID shows the performance scenarios. The column we should focus on is the 6yr returns. Note that the target IRR for the fund is 20% excluding tax relief – that’s higher than for the SR fund. SFC express this as a £2.50 return per £1 invested, returned after 5 years. I still haven’t found any detail on the exit strategy to achieve this. EIS growth funds are clearly not a mainstream product. Even within the subset of private investors looking for income tax relief, they are riskier and less diversified than VCTs. At the same time they are safer and more diversified than individual EIS investments. The Syndicate Room Fund offers perhaps better growth prospects than the basic Fund Twenty8, but comes with potentially higher costs and lower diversification. Retaining 10.5% of funds to pay future management fees seems a strange and off-putting move to me. There are also questions around the low target IRR and the lower hurdle for the performance fee. The main drawback of the Startup Funding Club Growth Fund is the £25K minimum contribution, which will put it beyond the reach of most private investors. But I’m also very much against the extra initial fee for non-advised clients, and a total initial fee of 4% seems very high to me. And I’m disappointed that they have abandoned their “performance-fee only” approach that they used for their earlier funds, but retained the low incentive hurdle. But each of the funds will appeal to some investors. And I think it’s good news that private investors have diversified and tax-favoured access to second-round funding. See I have been looking into EIS and VCT’s but the fees keep scaring me away. Everything specialist tends to be expensive, but regular VCTs work out OK.